Today’s post is all about the top 5 essential oils to support us wonderful women! Those precious essential oils that can help support us hormonally––and with PMS, periods, the menopause… and in the bedroom ❤️ . Clary sage––known for its relaxing, soothing and balancing properties––is often used to help with menstrual issues, including headaches and discomfort, and during menopause with symptoms like hot flashes. Because it’s a calming oil it is helpful if you’re struggling with feeling stressed or low. Clary sage is also known as an aphrodisiac, and to boost focus, and enhance creativity! Try adding a few drops to your bath*. Or dilute in a carrier oil and apply to your lower abdomen for relief during menstruation, or back of your neck, or wrists. This wonderfully scented oil helps to promote calm, lift mood, and is another great relaxing oil. It is also known to boost libido, and as an effective aphrodisiac. A perfect combo! To use: Try adding a drop to your bath. Or dilute with almond oil for a beautiful massage oil. You can also inhale it straight from the bottle, or your hands. Diffuse it in the bedroom. Or apply to your wrists as a perfume. Geranium oil helps to promote hormonal and emotional balance, and has both calming and grounding properties. It acts to support the adrenal cortex (which is involved with hormone release), and so it helps to promote hormonal balance right through, from puberty to menopause. Geranium essential oil is also an aphrodisiac. Try a few drops in the bath when PMS hits. Dilute with a carrier oil for an aromatic, sensuous massage oil. Or simply diffuse. Jasmine is commonly called the ‘King of Flowers’ and the essential oil has an amazing aroma. It can be used to support the nervous system and emotions, and as such is helpful during PMS, menstruation, hormonal skin issues, and with feelings of stress. It can help to boost mood and energy. Jasmine is used to help relieve some menopausal symptoms, including hot flashes, and low mood and energy. For support, either dilute and apply topically, or inhale the aroma. It also helps to lift mood, and is an aphrodisiac. Try diffusing the essential oil in your bedroom, or inhale from your hands. Or dilute in a carrier oil and apply topically. doTERRA’s Jasmine Touch comes ready diluted in fractionated coconut oil. Cypress essential oil can be particularly helpful for the menstrual abdominal discomfort and mood swings associated with periods. Add to a carrier oil and apply to skin. 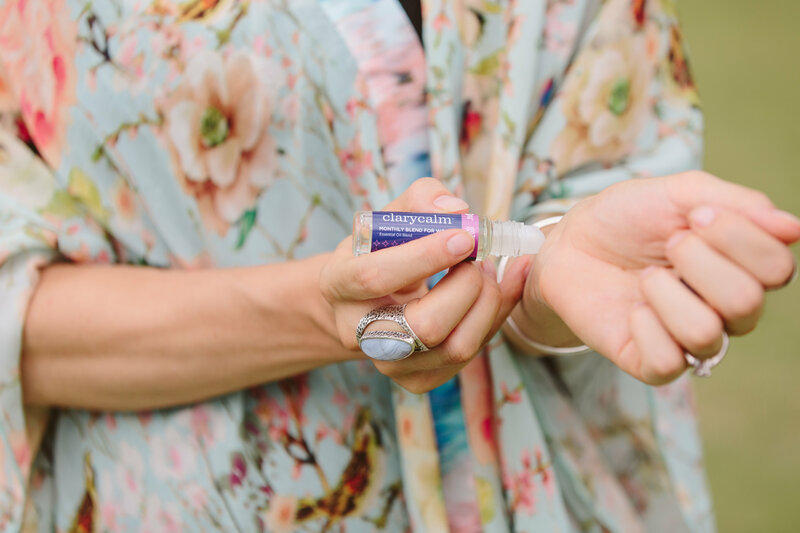 And of course no post on this subject would be complete without doTERRA’s wonderful and soothing monthly blend of ClaryCalm––bringing together clary sage, lavender, bergamot, ylang ylang, and geranium to name a just a few of the essential oils––helping to bring calm and balance to that tricky time of the month. Please note: Some essential oils are not advised during pregnancy. Please see doTERRA’s informational video ‘Pregnancy and Essential Oils’ for more information. *Remember to dilute essential oils with fractionated coconut oil or organic shower gel prior to adding to the bath, as oils and water do not mix and this helps to emulsify so that the oils do not remain concentrated and just float on top of the water. Which are your top favourite essential oils for these concerns? It was a informative blog & thanks for sharing it.